I have a workbench just like that! It's cleaner than my workbench . I'm a suffer of HSS, Horizontal Surface Syndrome, a cruel and debilitating malady that constantly robs me of working area. I think we all suffer from that Pete, just keep fighting it. Here's the glue setting up on the scarf joins. You can see the bow in the CTP bits that gives them a head start in the bending department. It's not quite as obvious, but they have twist as well. I've arranged them that the twist and bowing follow both the sweep and curve of the sheer. 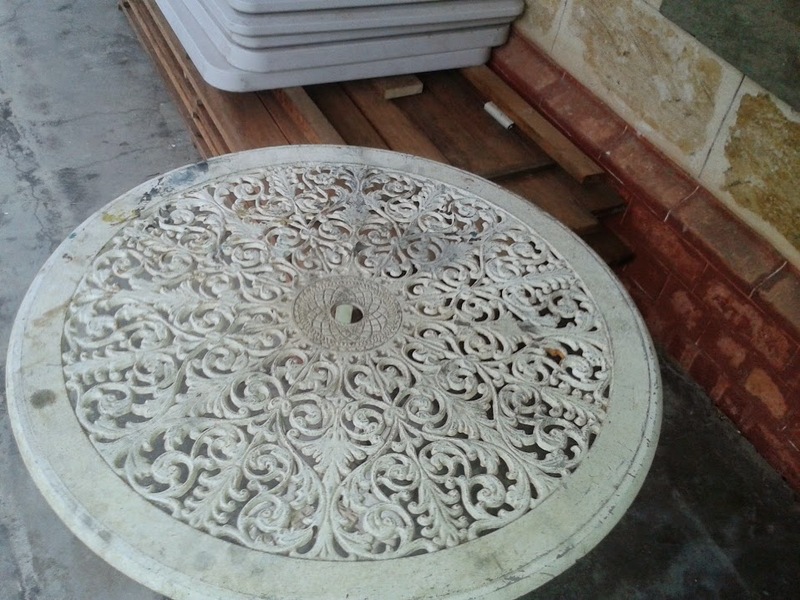 I think he meant the circa 1973 cast somethingorother outdoor table ....... which looks quite clean and uncluttered - unlike your workbench tch tch. My actual workbench is buried under an avalanche of tools, car parts, bits of wood, and stuff. Which is why the ally table comes in so handy. I love that you can bolt equipment down to the ally table through the top, it's a tripod so it's a breeze to chock up level, and it weighs very little so you can plonk it down anywhere you need to that suits the job in hand. I'm sure my old man would approve. They made a ton of the things and barely made anything from them because it took so long to clean up the fiddly castings. My workbench in the shed has started 'taking on' again and I must remove the stuff so I can do some more little jobs there soon. Mum had one but it's aluminium has been recycled . 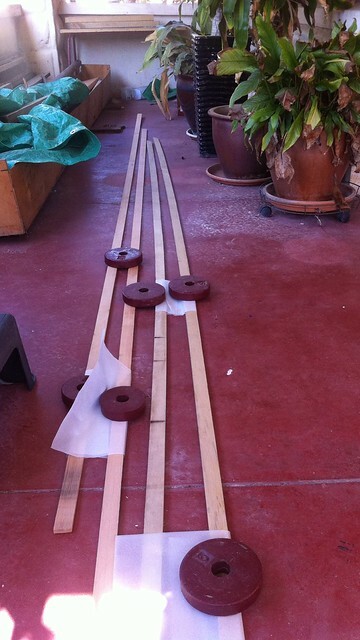 I'm making a dog's breakfast out of putting the gunwale strips on. I needed sixteen arms and a bazillion clamps doing a dry fit test. With the added humorous element of epoxy it needed a bazillion arms all wrapped in epoxy-proof veterinary gloves, plastic slaughterman's apron, more clamps, a trillion screws and a bucket load of more profanities. The plan was to do two strips today, one each side, and two strips tomorrow. I eventually got one strip on today before retiring with hurt feelings inside to tea and cakes and a nice lie down. My dearest life-love starts a part time job tomorrow, so if I get stuck again like I did today it's going to be mugly. No pictures until i have some fully set glue and either a partial success or a full failure to report. Sniff. The worst of it is that I haven't learned anything from it so I will be struggling along using the same process tomorrow. What I did was to paint on some raw epoxy onto the strip, then butter up the boat with thickened goo. Starting at the transom I put in a screw from the inside of the top plank through the strip, then moved forward maybe 300mm - 400mm, and put in the next screw. Then working like a very angry octopus I hauled up the strip into line with the top of the top plank, held it there with one hand and with the other hand drilled a new screw hole, changed from a drill to a driver, started off a screw in the hole, then drilled it home. Every couple of screws I went back over the work and put in clamps where needed to keep the strip from gaping away from the top of the plank due to twist. I worked my way to the bow along the port side sheer in this way, then went back and squeezed in epoxy anywhere there was a crack, and wiped it all down with a rag. On the port side that was my right hand on the drill. The starboard will mean a bit of ambidexterity will have to be added as well. At least, at this stage, the scarf joints haven't exploded yet. 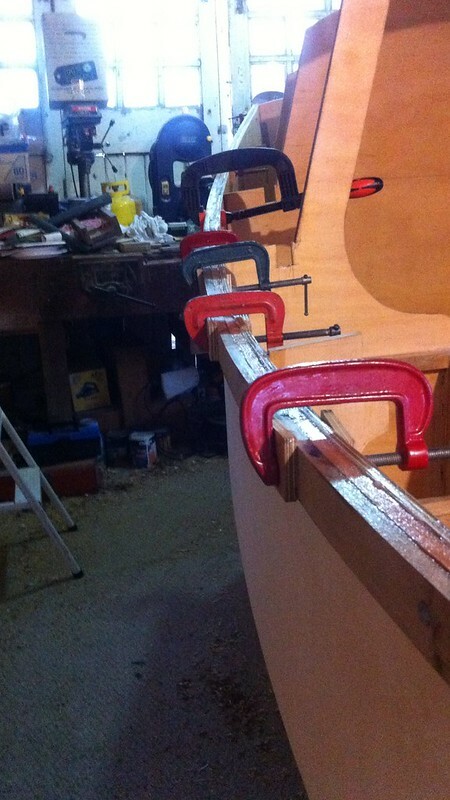 Would it be any help to run a line of temporary nails (or screws) along the planking, even perhaps slightly bent up, for the gunwale strips to sit on while you get the screws or clamps all in place as you work along, rather than having to try and juggle it? Take them out once you've got it all secure and the holes should fill with the fillet under the strip. That might even allow you to sit the strip on the run of temp' nails/screws before applying epoxy to it so that it's easier to handle - i.e. paint on the epoxy to the strip and just fold it up bit by bit as you work along. That would work if the planking was more than 6mm thick. It offers very little to fix to, and I'm even leery that the screws are deforming the ply. I think that maybe the Oregon is too structurally stiff for this job. A more 'limp' timber for want of a better term, maybe one that I could do in one 20mm x 30mm piece, would be substantially easier. I'm just not savvy enough about the properties of the sticks I've got here to use. The CTP seems to be more amenable to bending and twisting, I just didn't have enough of it for the job. Hoop pine probably would have been ideal. The Oregon is as strong as it comes. When these strips are on and bevelled, I have some old dry Teak to bend on as a rubbing rail. I can hardly wait. Last edited by brucemoffatt; 08-02-2015 at 05:51 PM. Does the build call for an inwale as well Bruce? That'd help to stiffen it up a bit. Or even get the side decks on first or a capping rail or whatever it is that goes over those frames. There are carlins set well in from the edge, on the other side of the frames. The side decks sit on top of the frames, the carlins and the gunwales. That gives a bit of an outer edge detail I am not overjoyed with, but it's a ply boat and there's always an end grain issue cropping up. The rubbing strip is supposed to cover the side deck end grain. Hang the far end of the strip on a bit of string from the roof. Butter the strip but only enough to wet it out, not enough so the epoxy will dribble off - you could just use neat resin. 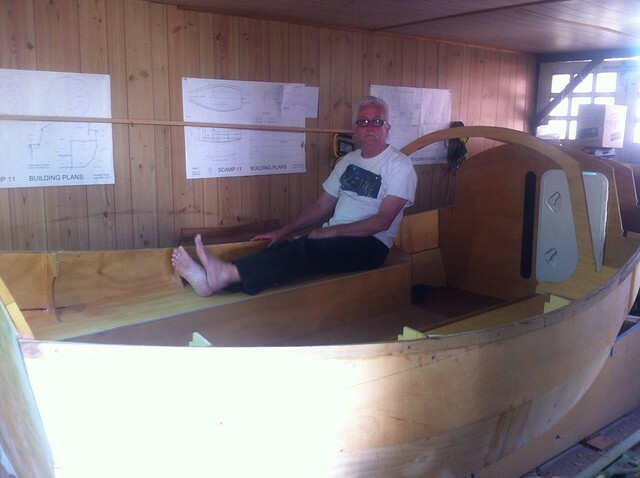 Then butter the forward part of the boat where the strip is going on, and clamp the forward end of the plank on. Keep doing this, buttering just a section at a time, and clamping, until you get to the end. 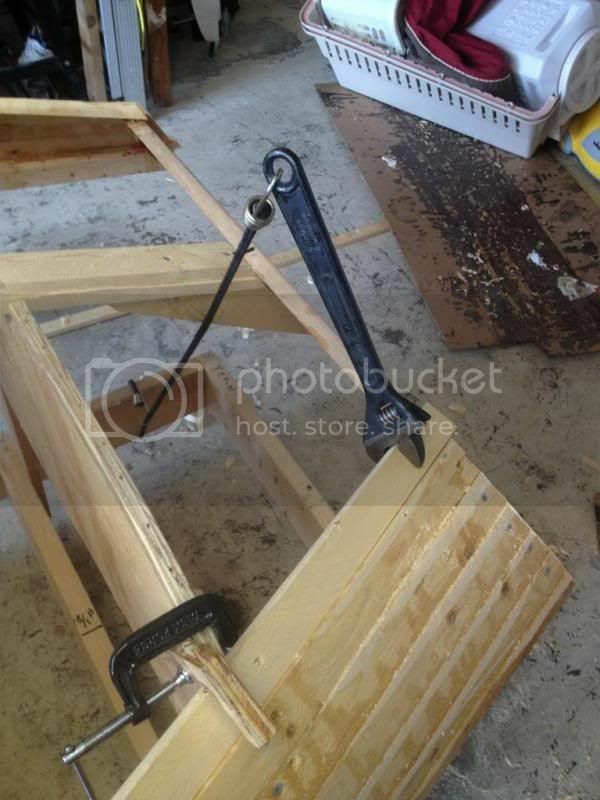 Then go back and fasten it from the forward end, adjusting the position and removing clamps as you go. 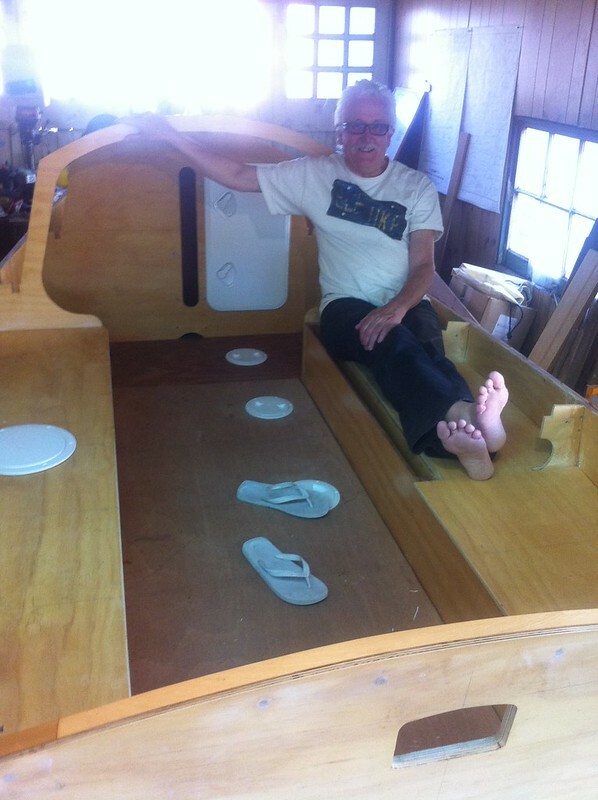 I watched the glue go hard and the grass come out and the clouds go past, and after dinner, with the benefit of daylight savings time, I glued on the outer port gunwale strip. It was less traumatic. I did a combo of everyone's suggestions including the building manual. Tomorrow I may get the others on after all, with luck and rat cunning. Photos just don't do the beautiful sweep of the sheer any justice. You did well getting those clamps with pads onto well lubricated sliding bendy spring parts Bruce. I reckon you need 3 times as many though. I have about 50 or so wedge clamps made of scrap ply which are pretty good for that job, but it's probly a bit far to come and get them. 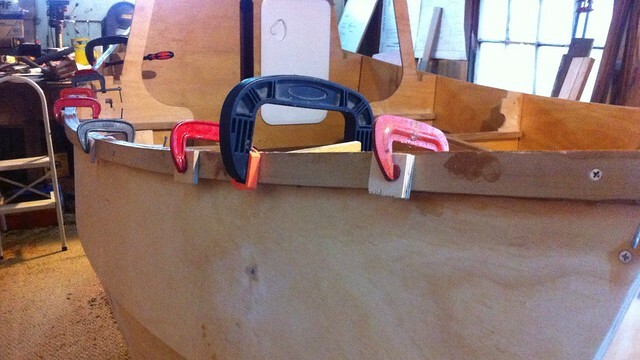 The starboard side gunwale strips are now both screwed and glued to death onto the boat. By the last half o the last strip I almost felt like I was doing it right. I was alone for the day so I did this side single handed. I had no show of doing the first strip of the port side by myself. 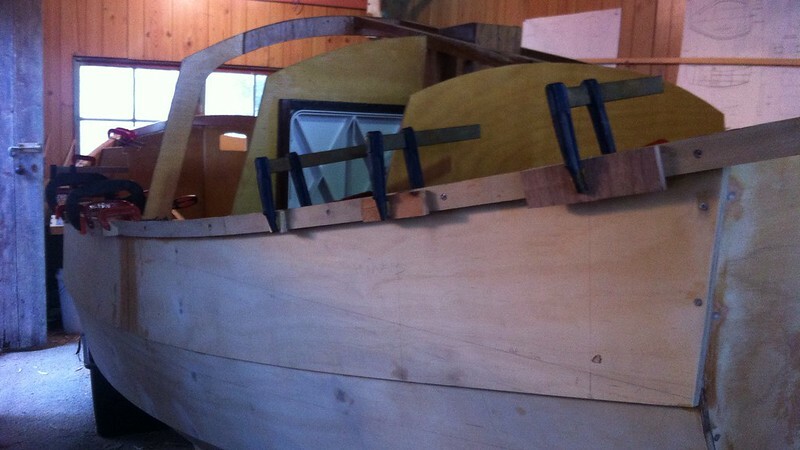 There will be a fair bit of filling and fairing to come, however this is the biggest of the jobs I wanted out of the way before the boat rolls over so I can tackle under the hull. Now comes sanding, smoothing, filling, patching and even painting under the seat tops, and other sundry prep jobs. I've located a table that I will be using as a support when she is flipped over, so maybe a week of fiddling about then some more fun stuff. Here's a video of how she looks so far. She's remarkably roomy for a small boat Bruce , very impressive indeed ! when I need extra arms/hands I use bungy cords. Strap the long piece in place every 4 to 6 feet then go back and place scrap blocks under the piece to give you some room to you can spread your epoxy and clamp as you go down the strip. advanced bungy cord user tip: put an adjustable wrench on the far end and use a bungy to put twist in the plank while you're attaching it. Keep all the good info and tips coming in please, I need all the help I can get. I'm having to take extra care of my body for a few days - no cuts, scratches or splinters allowed - so I'm staying away from the tools. I couldn't help having a bit of a lounge in the cockpit though just to see if I'll fit. Hey Bruce, I see you're having a fit! You nearly fit but bigger would be better ! This is bigger. 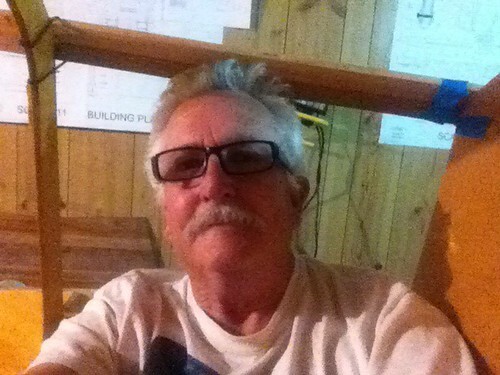 Sitting under the veranda with my back to the port cabin side beam (not visible, behind me) and under the veranda roof. Short arses rool. That's a big little boat. You'll need a proper bowsprit though to make up for the stumpy bow! Last edited by Larks; 10-10-2014 at 07:20 AM. Looks like a pretty comfy to mr Bruce. How about length for sleeping on the cockpit floor? Cool hatch Mr Moffat ! I think your`e build is going just fine . Very cool little boat and a great progression thread! Being a yank I have laughed out loud at some of your descriptions, like the 'power tool going feral', 'rat cunning', and a few others. I might have have to incorporate them into my lexicon. I have seen some smaller boats like yours with a bowsprit and a little dolphin striker, maybe with a clipper style board under the bowsprit (not sure the proper terminology). Just an idea...thank you for posting the progress as some of us beginners need the inspiration!